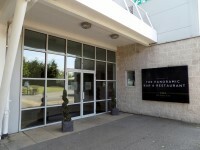 The racecourse is located on the A308 between Sunbury-on-Thames and Hampton Court, less than one mile from Junction 1 of the M3 via Junction 12 of the M25. Priority car parking is provided to owners and trainers and those with a Blue Badge and this is accessed via Gate 1 in Park Road. Free parking is available on all of the racedays. The main car park is free at the majority of fixtures, however this excludes all jump fixtures as well as the 31st March, 7th April, 15th August and 8th September. On all of these fixtures there is a £5 charge per car for the main car park. The nearest Railway Station is Kempton Park Station. 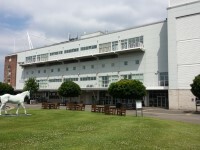 Kempton Park Racecourse boasts its own train station on-site – Kempton Park – which is situated 200 yards from the North entrance. Trains run every half an hour direct from London Waterloo with the journey time being just 40 minutes. Please note that trains don't run on Boxing Day but there is a bus service from Turnham Green Underground Station. This station is accessible via tube on this day. 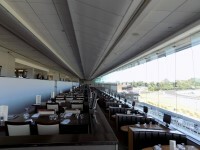 For a map of the racecourse please click here (new tab). You are on Raceday Parking. Skip to the next section. For more information about the Raceday Parking please click here (opens in new tab). 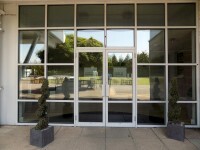 You are on Outside Access (The Panoramic Bar and Restaurant). Skip to the next section. This information is for the entrance located on the Parade Ring side of the Main Grandstand. 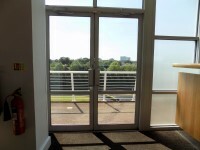 You are on Other Floors (The Panoramic Bar and Restaurant). Skip to the next section. 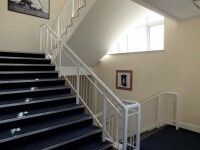 The stairs are located to the right when entering the Panoramic Bar and Restaurant entrance. 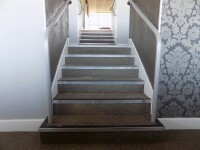 The stairs are approximately 11m from the Panoramic Bar and Restaurant entrance. 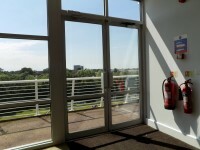 There are manual, heavy, double doors to enter and exit the stairwell on the ground floor. 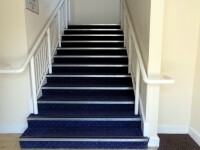 The floors which are accessible by stairs are G, 1, 2. 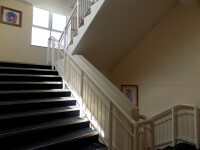 The height of the step(s) is/are 18cm. You are on Lift (The Panoramic Bar and Restaurant). Skip to the next section. 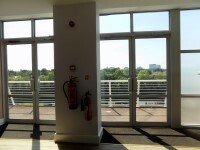 The lift is located to the right when entering the Panoramic Bar and Restaurant entrance. 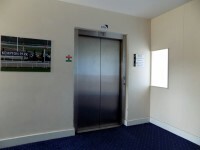 The lift is approximately 6m (6yd 1ft) from the Panoramic Bar and Restaurant entrance. 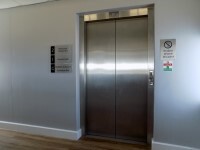 The floors which are accessible by this lift are G, 1, 2. 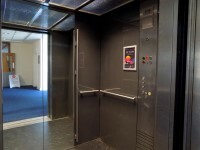 The dimensions of the lift are 140cm x 190cm (4ft 7in x 6ft 3in). 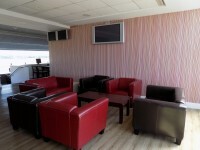 You are on Reception (Second Floor - The Panoramic Bar and Restaurant). Skip to the next section. 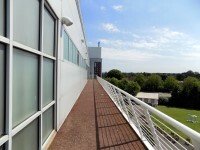 The reception point is located in the lobby area, on the second floor. The reception point is approximately 5m (5yd 1ft) from the lift. 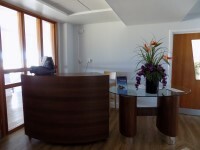 The lowered section of the reception desk is 89cm. 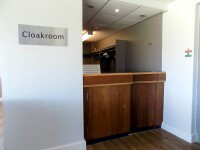 You are on Counter (Cloakroom - The Panoramic Bar and Restaurant). Skip to the next section. 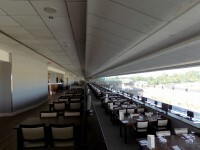 The counter is located to the right when you enter the Panoramic Bar and Restaurant. 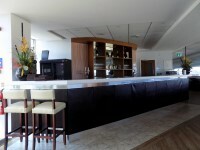 The counter is approximately 3m (3yd 10in) from the Panoramic Bar and Restaurant entrance. Clear signage for the counter is visible from the entrance. 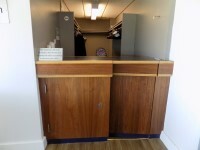 There is step-free access to the counter, via lift. 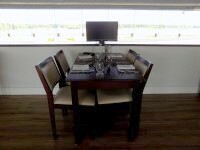 You are on Eating and Drinking (The Panoramic Restaurant). Skip to the next section. 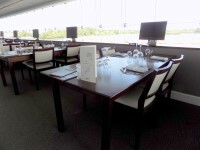 The restaurant is located on the second floor of the Main Grandstand. There is step-free access, via lift, to the restaurant. 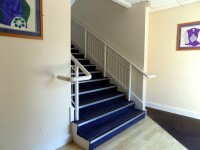 There is stepped access within the restaurant. The distance between the floor and the lowest table is 63cm. The distance between the floor and the highest table is 71cm. The lowered front section of the restaurant has fixed tables and seating. 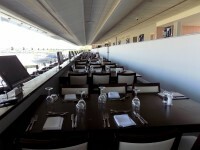 You are on Eating and Drinking (The Panoramic Bar). Skip to the next section. 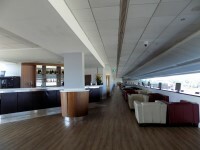 The bar is located at the rear of the Panoramic Restaurant. 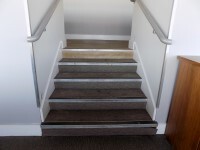 There is step-free access, via lift, to the bar. The height of the service counter is high (110cm+). All chairs have armrests on both sides. 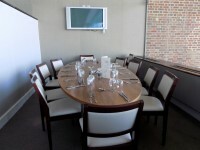 The standard height for tables is 63cm. You are on Step(s) (Middle and Lower Seating Areas). Skip to the next section. 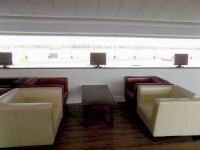 The step(s) is/are used to access middle and lower seating areas of the Panoramic Bar and Restaurant. 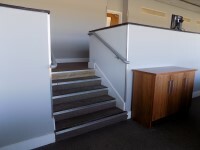 There are 5 steps with handrails on both sides leading down to the middle tier seating area. 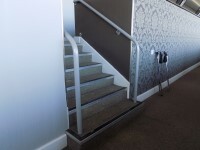 A further 5 steps with handrails on both sides then lead down to the lower front section of the Panoramic Restaurant. You are on Counter (Betting Counter). Skip to the next section. 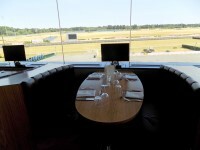 The counter is located at the rear of the Panoramic Bar and Restaurant. The counter is approximately 48m (52yd 1ft) from the lift. Clear signage for the counter is not visible from the lift. The counter is placed in front of a background which is patterned. 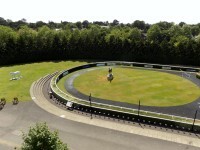 You are on Parade Ring Viewing Balcony. Skip to the next section. 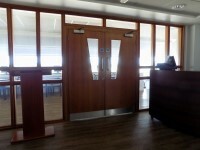 There are three sets of double doors leading out to the Parade Ring viewing balcony. The doors are heavy, push away from you and are 160cm wide. 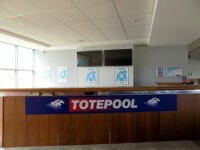 There is level access to the Parade Ring viewing balcony. 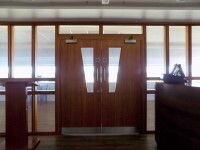 A small lip is on the threshold of each set of double doors. 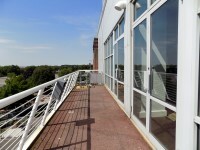 No seating or tables are located on the balcony. There is room for a wheelchair user on the balcony. You are on Accessible Toilet(s) (Second Floor Lobby). Skip to the next section. 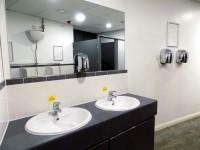 This accessible toilet is located off the second floor lobby area. 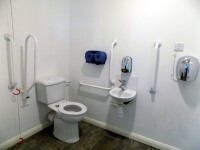 The dimensions of the accessible toilet are 163cm x 214cm (5ft 4in x 7ft). 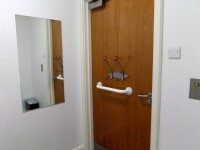 There are coat hooks in the toilet at 114cm and 138cm from the floor. 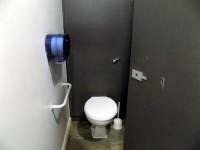 The height of the toilet roll holder is 109cm (3ft 7in). 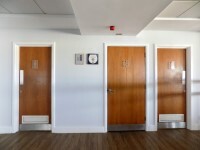 You are on Standard Toilet(s) (Second Floor Lobby). Skip to the next section. 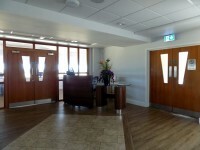 The female toilet facilities that were surveyed are located opposite the reception desk on the second floor. 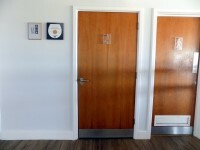 The female toilet(s) is/are approximately 2m (2yd 7in) from the lift. There are vertical and horizontal grab rails on the left hand side only. The wash basin(s) tap type is lever. 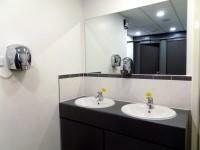 The male toilet facilities that were surveyed are located opposite the reception desk on the second floor. 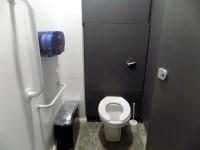 The male toilet(s) is/are approximately 5m (5yd 1ft) from the lift. There is a horizontal grab rail to the left of the seat. 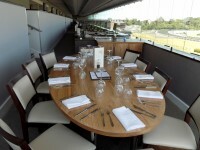 Getting around the Racecourse link (new tab) - click here. 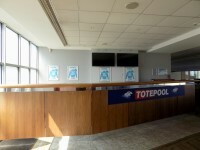 Betting counters around the Racecourse link (new tab) - click here.